No one wedding can do without flowers. They decorate the newlyweds’ car, they are used on the banquet tables and in the hall, the groom attaches a buttonhole to his suit, and the bride carries a gentle bouquet in her hands. Guests of the wedding, too, bring with them floral compositions to present them to the newlyweds and congratulate them on the most important day in their life. How to choose the right wedding bouquet? the form of composition – small bouquets are considered more appropriate for a wedding, because they do not take up much space. With the help of these tips you can create a unique bouquet that the newlyweds will definitely like and it bring them positive emotions. Red roses or other red flowers at the wedding are considered inappropriate, as they symbolize passion and strong love. Also, do not choose gerberas, because they mean flirting. It is best to choose gentle pastel shades, which are a symbol of purity and innocence. You can create a bouquet for a wedding from the convallaria, dahlias, pions, because they symbolize fidelity, joy and love to life. Lilies, asters and orchids are symbols of tenderness and elegance. If the newlyweds are your close friends, then you can create a bouquet of chrysanthemums, which means friendship. 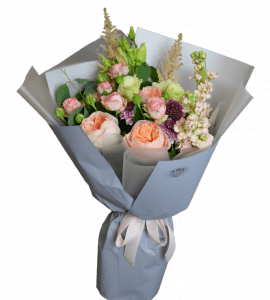 If you want to gift a bouquet to a bride and groom separately, then consider that to the man is more approporiate a restrained composition. Choose green and blue tones and an elongated shape. It is better to give flowers directly in the basket, in order to the newlyweds or witnesses do not need to look for a vase. Florists add a sponge soaked in water, so that the bouquet is kept fresh and beautiful for long. What flowers are best for a wedding? orchids – exotic flowers that look particularly romantic and tender. 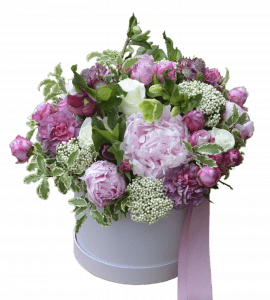 Where is it possible to buy a bouquet for the groom and the bride in Kiev? If you need a perfect bouquet for a wedding, the florists of STUDIO Flores are ready to create it for you!